Best Humidifier For Your Baby: Which Option Best Fits Your Family? How do I pick the best humidifier? What Are Humidifiers And How Do They Work? What exactly is an essential oil diffuser? What is a humidifier and what makes it different from an essential oil diffuser? What A Warm Mist Humidifier And How Does It Work? When it comes to a humidifier for your baby, there are many options. But, before we discuss which humidifiers are the best, we should give you a quick overview of why your baby should have a humidifier in their room while sleeping (or resting). The most obvious advantage to having a humidifier in your baby’s room is not having stagnant, dry air. This is especially true in the winter months, when your heating system (regardless of the type) “robs” the air of its moisture in your home. Your new humidifier will fight against the constant sore throats, dry sinuses and stuffy noses. Can you imagine your baby getting sick all because you didn’t know a humidifier was such a crucial piece of equipment? I would hate to see my child sick because of dry air (could be avoided with a humidifier). Humidifiers do not just have health benefits for your baby; they also allow your baby to fall asleep and stay asleep longer (which is every mother and father’s dream)! Let me explain this phenomenon, babies (and adults) find it soothing to hear some sort of “white noise” while going to sleep, many adults improvise by using machines that disburse the sound of “ocean waves”, or play the sounds of “a tropical forest”, but with a humidifier a small noise is produced, soothing your baby through a long and fitful night of sleep. A humidifier is not only a basic item to keep your child healthy, but it purifies the air in their room making it clean and very pure. There are a couple differences when discussing humidifiers. For example, whether to use a cool mist type spray, or use a warm mist spray. The advantage to choosing a warm mister is the unit has been proven to actually kill germs and any type of air born virus that may be getting close to your child. The advantage of using a cool mist type unit, is to avoid any type of burns your “young one” might incur if they get too close to the unit and end up touching some of the “hot” components. Which brings me to my next point, make sure to always keep your humidifier out of reach of your child, even if you went with the cool mist option, it’s better to be safe than sorry! There are also a couple different types of humidifiers: table top humidifiers, console humidifiers and induct humidifiers. A tabletop humidifier is perfect for a family that is looking to only have the humidifier in your child’s room. A console humidifier is much larger than the table top model, it can hold up to nine gallons of water, and (if positioned correctly) can humidify your entire house. The last (but certainly not least) humidifier is known as the “induct” humidifier, this option allows you to have a humidifier right in the vents of your house making the entire house more comfortable with the touch of a button. The “induct” humidifier is also the most expensive of the three options. If you are looking for the most cost efficient model of the three, your best bet is to go with the tabletop humidifier. The first thing that you need to look into is pricing, find what you can afford and go with that option. For example, if you have the budget and having a comfortable house is very important to you, I would suggest you go with the “induct” humidifier. It is by far the most reliable type of unit and can begin to work in the matter of minutes (sometimes seconds)! Or, maybe you don’t really have the budget for a “serious” humidifier, but you understand the significant health benefits that can contribute to your child’s well being, I would suggest you purchase a table top unit. The table top unit is still very good and can still help stop sore throats and stuffy noses, just because it’s not the most expensive option does not mean it’s not effective. The ideal temperature and humidity levels for a baby are as follows: The humidity should be ideally 50% and the ideal temperature is 70 degrees Fahrenheit. Therefore, the humidifier you decide to purchase must be able to deliver the 50% humidity level. If the humidifier cannot deliver the 50% humidity level, you can move on to the next potential humidifier. Its also best that your humidifier is “low noise”, even though we discussed earlier that having a little bit of noise (like background noise) is a good thing, and will allow your child to sleep, you don’t want the humidifier to be too noisy and keep your child up all night. Another really cool feature that is important for your humidifier to be equipped with is an automatic shut off. What this does, is when your humidifier runs out of water, it will automatically shut off, other units will simply run all night, making a serious fire hazard (which is the last thing you want in the same room as your baby). One thing that is often overlooked when trying to find the best humidifier for your child is the cleanliness and the antibacterial qualities. Buying a humidifier that is “antibacterial” usually will solve this problem, if it is approved than you won’t have much to worry about (for instance, the humidifier spreading germs through your child’s room). But let’s say that you have already purchased your humidifier and are looking for the easiest way to keep it clean and ensure that no bacteria is “brewing” in your humidifier appliance. This problem is easily solved, simply pick up some antibacterial soap and give EVERYTHING a scrub down of the unit, this includes the exterior, the crevices and especially the tank that holds the water. Using the following criteria I have carefully outlined above, I have developed a list of my favorite humidifiers that I think are the best you can buy. Included below the bullet point where the name of the humidifier is mentioned, please note the “distinguished feature” each unit holds. 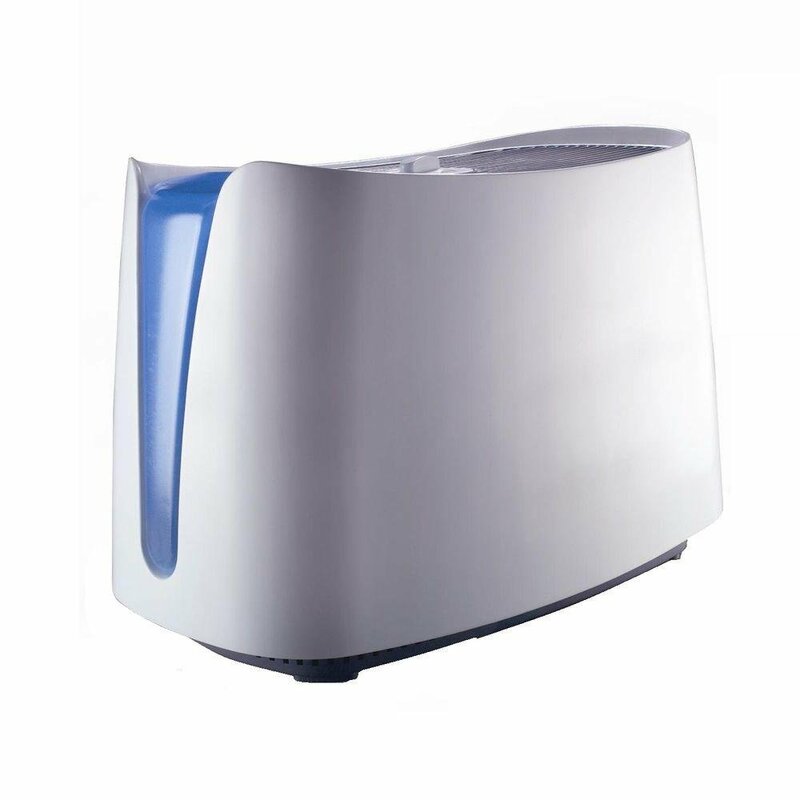 The Purasense humidifier is an example of a great technological output in the present era. The humidifier helps maintain an accurate balance of humidity back at your home. It helps you bring down the temperature of your room by cooling and humidifying the mist in your room giving you a pleasant temperature to live in. Taking the convenience of the common masses into consideration, a number of web portals have made this humidifier available to the common masses at a clicks interval. You can always have a comparative study of the specifications that have been provided in the different portals. The humidifier has a number of attractive features that contribute to its popularity. Let us take a look at a few notable features of the product. 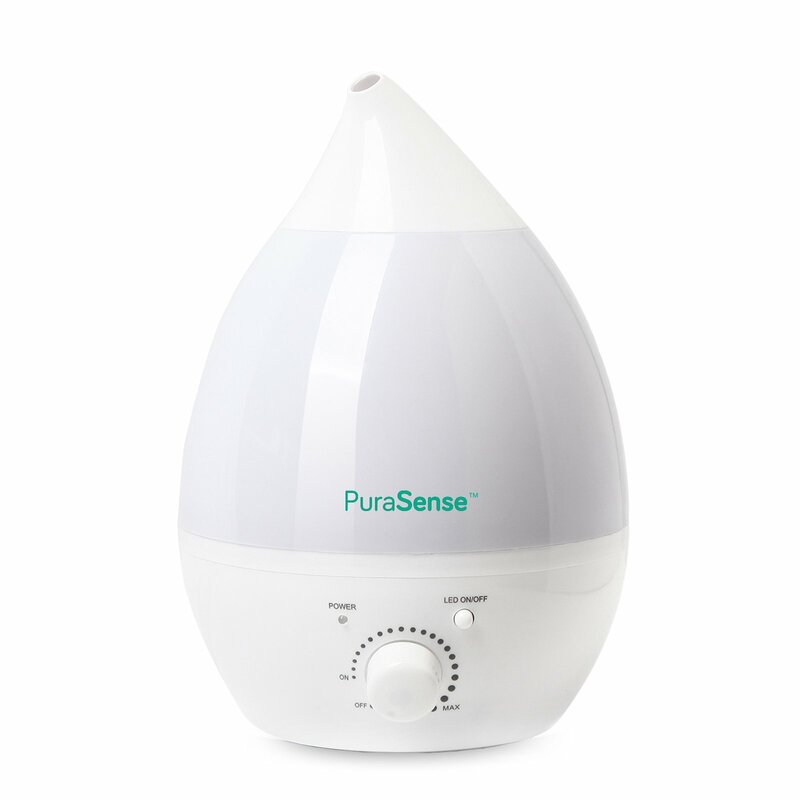 The Purasense humidifier has a fixed water tank that has a capacity of 1.3 liters. It runs on an ultrasonic technology that makes it by far a great buy for the consumers. With a stylish and effective system of 538 sq.ft, it is made up of a stain resistant and durable plastic material. The controls of the humidifier are quite simple and can be operated by both kids and adults alike. Adding on to the hygiene of your family, the product comes with a micro porous cartridge that prevents the building up of micro organisms within the humidifier. The sound proof feature of the product works as an added advantage for it. Helps clear out a massive amount of mist together. The product is quite small and does not occupy much space at your home. The diffuser tray helps you add on a few drop of scented oil that releases a pleasant fragrance during the night. The controllers are easy to use. The price of the humidifier is affordable. It comes with a manual that is quite easy to follow and helps you deal with all the important specifications. It is portable in nature and has an alluring design that adds on to its popularity. Might not run as per the run time that is guaranteed for the product. The machine is reported to emanate white powder along with the moistures that it releases. There have been complaints about the product not living up to the standard of the warranty that has been provided by the manufacturers of the product. Thus, after going through the aforementioned specifications, pros and cons you can definitely try out this unit. It has all the latest materials and pre-requisites incorporated and it has also been certified as per the laid down regulations. All Purasense humidifiers have been examined properly by a group of expertise before being dispatched out in the market. This assures complete safety to the consumers in terms of its usage, its longevity, its durability and a host of important aspects which consumers usually look for while buying such commodities. If you belong to a dry region or have problems with too dry air, then you must be quite familiar with the brand Crane that offers a number of humidifier options. While its previous humidifiers like the frog, mouse, owl were quite famous, the new product Hello Kitty isn’t much far either. This novel Crane cool mist humidifier has attracted the attention of many in the market and not in vain. Read on to know more. The Hello Kitty product is just the ideal thing that you would like to add to your child’s room or even your room if you really like cute things. It comes in a lovely pink kitty design which is compact and can match most home decor ideas, especially those that are quite vibrant. Use of whisper quiet technology in the manufacturing of the product. Helps solve problems like allergy, skin itches due to dry skin, coughs, migraines, etc. Comes with a mild night light system. Being quite cute and lovely, it works great for kids and compliments your home décor style too. The humidifier being very quiet can help you sleep peacefully even when it is in use. The humidifier is child safe. With a 1 gallon capacity, the humidifier can work for two days before being filled again. The amount of mist that it generates is good enough if your child suffers from dry coughs at night or your dear ones suffer from skin irritation, bronchitis, etc. due to the super dry weather. The mist control button can be turned all the way through giving you the opportunity to set it very precisely to get the exact environ that you need. The night lighting system that comes with this humidifier is very useful if you do not want to sleep in pitch black darkness. The motor of this Crane cool mist humidifier may start creating noises after some months of use. The spring used inside may turn yellow after some regular use. It is obvious that no product can be 100% error free and faultless and so it would be unrealistic to look for the same. 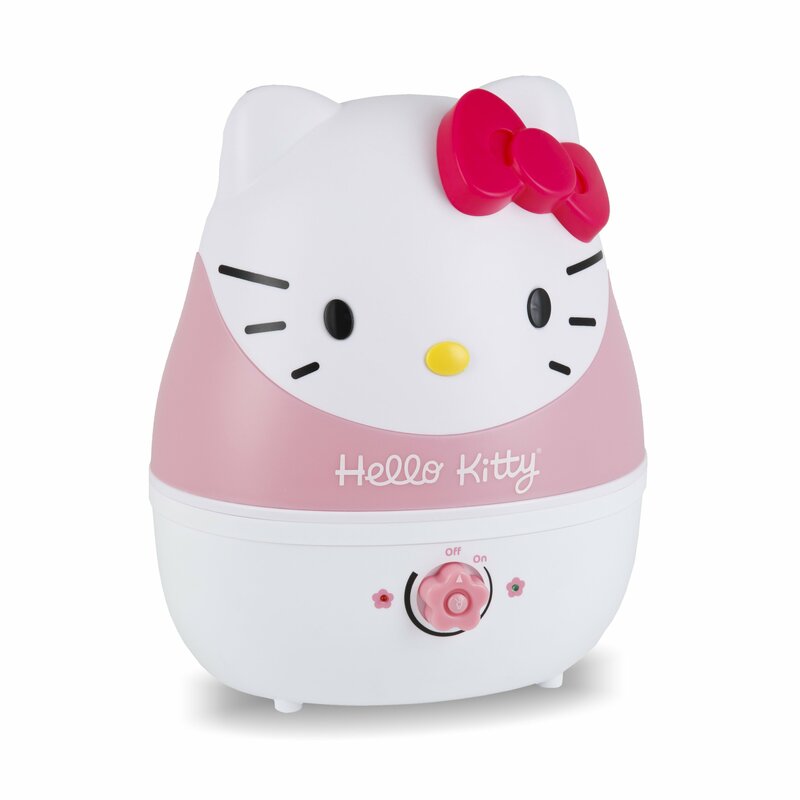 There may be a couple of faults in the Hello Kitty product, but it is nonetheless a good humidifier amongst many others in the market. It is easy on maintenance and you need not to fill the water every day, if you have moderate use. Besides, it is a cool and cute product and would inevitably be loved by all members of the family, especially your children. When it comes to beating the heat at an affordable price, a humidifier is the best product to avail. Honeywell is a reputed brand in the world of wonderful humidifiers. In this segment we will speak of one of the latest products in this department. According to the honeywell humidifier review, it has been made out of germ free technology along with a UV technology. The humidifier helps kill almost 99.9% of the germs that is present in your house. The Honeywell humidifier comes with a tank that fills up with great ease. The tank is portable in nature that makes humidification more convenient than ever. Has an antibacterial formula that helps in killing about 99% of the bacteria and viruses that is there in your house. Comes at an affordable price that brings it within the reach of the masses. The product is quite a good buy. You can safely use the product even with children around. The product is quite lightweight, making it convenient for the users to carry it around. The translucent water tank lets you have a see through view of the water filter within. Keeps the room humid definitely and helps you stay calm and cool. You can replace your filter after 6 or 7 months. No need to change it regularly. It is very easy to set up and use too. You need to refill the tank every day. It does not have a humidistat which makes it difficult to control excessive humidity. There have been complaints of tank leakage from several consumers. The storage for the water is quite small. According to some users this product does not increase humidity in excess of 4%. Customer service is not really good. Just in case you are looking for a humidifier that can provide you with the perfect amount of dryness along with a healthy environment, this humidifier is definitely worth a pinch in the pocket. Even though there are few bad or negative comments, but there are more than enough good comments that can certify this product as a good buy. And when you will get a germ free environment along with cool and humid room, you will surely go for it. One thing you can be sure of is that if you buy this product you will not regret sparing those extra notes in any way. When in need of a perfect oil diffuser, the URPOWER 500ml Aromatherapy Essential Oil Diffuser is definitely a look into the genre of the same. These humidifiers help you reduce the amount of humidity that is there in the air, thereby giving you a very comfortable experience back at your own. One of the most attractive feature of the product is that it has an illuminating feature that lets you have a clear view of the commodity even in the dark. What better than a softly illuminated room with a lovely aromatic atmosphere at home after a tiring day at work? Let us take a peek into some of the most alluring features that this particular oil diffuser has. Has an ultrasonic diffuser technology that produces vibrations at a rapid speed to break down oil and water particles into finer micro particles without making use of heat. Has a water capacity of about 500 ml and can be used for a continuous time span of 10 hours at a go. The URPOWER 500ml Aromatherapy Essential Oil Diffuser has automated buttons that help in performing functions in a smooth manner. An advanced technology that prevents and eliminates stale air along with the allergens. You have an option to adjust the intensity of the spray. Helps in improving the quality of air that we breathe in. Combats harmful ions that are present in the air. The water purification provides the consumers with a healthy life. Prevents problems like skin irritation and is of great help in health issues like dry cough and other skin issues. You need to clean it frequently that becomes a matter of great trouble. The consumers are not provided with a extra package of oils. You need to spend a few extra bucks to buy the aromatic oils. The fragrances of the oils are not emanated in a comfortable manner. There have been reports of foul smell being let out by the machine during the oil breakage. This URPOWER 500ml Aromatherapy Essential Oil Diffuser has been made available by a number of web portals in the most affordable of all prices. You get to choose among the wide range of colors and sizes as per the requirement of your space. The Ultrasonic technology helps in the better diffusion of the particles. You can always have a look at the reviews that have been provided by the customers to be assured about the decision that you make. It helps you make the right decision. Buying products online has advantages of its own as you get the opportunity to compare the various aspects of a product. The product is a must buy in the group of oil diffusers in general. It is a combination of both efficiency and class at the same time. Online is definitely the way to be when you cannot go out there in the market and buy a particular product for yourself. 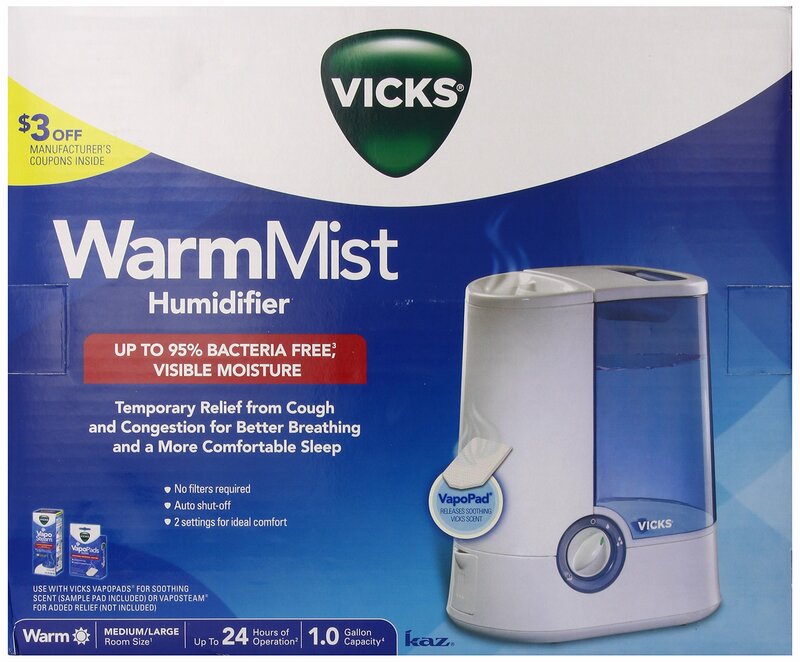 Talking of humidifiers, the Vicks humidifier has gained a considerable amount of popularity since its advent in the market. It stands out as a perfect amalgamation of style, price and efficiency at the same time. The product comes with an array of alluring features and is available at almost all the renowned web portals that you can think of. The prime aim of the commodity is to bring down or rather control the level of humidity present in your room when the atmospheric temperature is quite high outside. Comes with a capacity to run for about 24 hours at a go once you fill the tank. The mist humidifier is a replaceable one. You can get it replaced from the market in case it gets damaged. Consumers are provided with an easy to read manual that helps you follow the instructions of the product in a proper manner. A pad slot has been provided to insert the aromatic oils that you use with great ease. Has an auto off feature that helps you save electricity. In case you run out of water the machine stops automatically after a certain point of time. The heat, let out by the commodity is absolutely accurate and gives you a smooth and comfortable atmosphere to live in. It can be cleaned quite easily. You can make use of simple home products to clean the entire device. The product is quite skin friendly and takes care of your skin during harsh winters. You can keep your skin dryness at bay. The humidifier is quite noisy. It can hamper your sleep in case you are a light sleeper. There have been complaints regarding the leakage of the product. The product is not suitable to be used on an overnight basis. Might not live up to the time duration that is guaranteed by the manufacturers. With abnormally rising temperatures and a humid weather, humidifiers have become a necessity in the recent times. They act as a cost effective method to cut down the heat and have a comfortable sleep at night. The best thing about purchasing this Vicks humidifier is that it not just lets you cool down the surrounding atmospheric temperature, but also helps you make use of scented oils to create a beautiful ambience back at your home. General reviews provided by customers on the product let you have an idea about the correct choice that you need to make sure you review the various prices offered by different web portals before you jump onto a conclusion. There are plenty of humidifier options available in the online world. Choosing the one which is suitable for your needs is really a tough job. If you are wondering which you should choose, then Zen breeze humidifier can be a good choice for you and with the kind of benefits it provides, it is a very a great option to buy for home. This humidifier unites scientific innovations with a contemporary design and proves to be a wonderful option. Below are the features of this humidifier which will surely allure you to buy it. This alluring wood grain diffuser employs vibrating sound waves which can please your senses. The diffusion mode does not make use of the heat and thus maintains the essential oil and holistic components. Simply run your hands through the unit and you will notice if it is cold or hot. This product would prove to be a great option if you are concerned about the health of your home as well as business place. The unit is one of the best innovations in 2016 and there are lots of positive reviews about it from both users as well as the experts. This unit comprises of 14 beautiful color changing LED light which shines in the dark. It works as a wonderful light for the whole house. It helps you from the problems of sinus, flu and cold germs as per the professionals. You can set the timer to 60-180 or 360 as per your needs. Some have said that the vapor is not properly dispensed. So, as you can see this humidifier can be a great option for your home. The features which is incorporated are superb and with the materials put together, its makers seem to have done a wonderful job. This unit is a combination of style and efficiency together. Since you can buy the product online, you will get the chance to compare the various technicalities and prices with the other similar products. It is a perfect way to remove the excess humidity and maintain a comfortable ambience at home or your office premises. A must buy! One drawback of a winter season is the low humidity. Even when you are in a warm room, with windows open to let in fresh air, you will always feel that something is missing. Low humidity interferes with your breathing hence make you and your baby uncomfortable. To solve this problem, you need something that brings back the right levels of humidity to your house and nothing does this well than a humidifier. Just as the name implies, Humidifiers are devices that work best in ensuring that the atmosphere in your house remains moist. One major purpose of all humidifiers is to increase the atmosphere’s moisture. However, how they do this differ from one type of a humidifier to the another. There are four major types of humidifiers namely, mist evaporative, warm mist, ultrasonic and last but not least, UV germ-free humidifier. Here is a brief overview of how each of the four types of humidifiers works. When you go to the market looking for a better humidifier, the dealer is likely to suggest a cool mist humidifier, why? Experts consider it the best when it comes to delivering pure particles of air free of pathogens. This simple device features a wick filter that is found at the base of the device that absorbs the water you pour in it. The fan in the humidifiers then forces the dry air in your house through the wick filter, making the water in it to evaporate into your home air. One fascinating fact about the wick filter is that it traps each and every impurity that are present in your water ensuring that the moisture delivered in your room is clean. If you live in an area characterized by cool weather, then warm mist humidifier will make a perfect choice. Just as the name implies, warm mist humidifier features a heating element that it uses to heat up the water in the device to achieve the right temperature before it delivers the water converted to warm steam into your home air. If you are looking for humidifiers that will work best to destroy all the harmful pathogens in your home air, then you might find a UV germ-free humidifier quite fascinating. This simple device kills approximately, 99.9% of all the pathogens in your home air using ultraviolet light. This is one best humidifier you must have if you are too cautious of your baby’s health. This is one type of a humidifier that you will admire at a first glance. They are also the quietest compared to several types of humidifiers. An ultrasonic humidifier uses high-frequency waves to stimulate vibration of a metal device located in the device that in turn breaks the water particle into a fine vapor mist. These fine particles of water are then delivered into your home air by a fan quietly bringing back the required levels of humidity. The first time you go into the market looking for a humidifier and can’t find one, there are high chances the store owner you are buying from will suggest an essential oil diffuser. The main reason this might happen is because the two share several similarities. It isn’t easy to distinguish between the benefits simply because they all work best to improve the air you are breathing. However, it isn’t advisable to fall into the trap especially when you are looking for something that will benefit your baby. To help you make a wise choice here is a brief overview of the differences that exists between an essential oil diffuser and a Humidifier. An essential oil diffuser is simply a device designed to disperse essential oils from nature into your home air destroying pathogens and replacing bad scented air with Nature’s given oils and a pleasing fragrance. One fascinating fact about this device is that it delivers fine particles of essential oils that can be easily absorbed by your skin and into your system hence the health benefits. 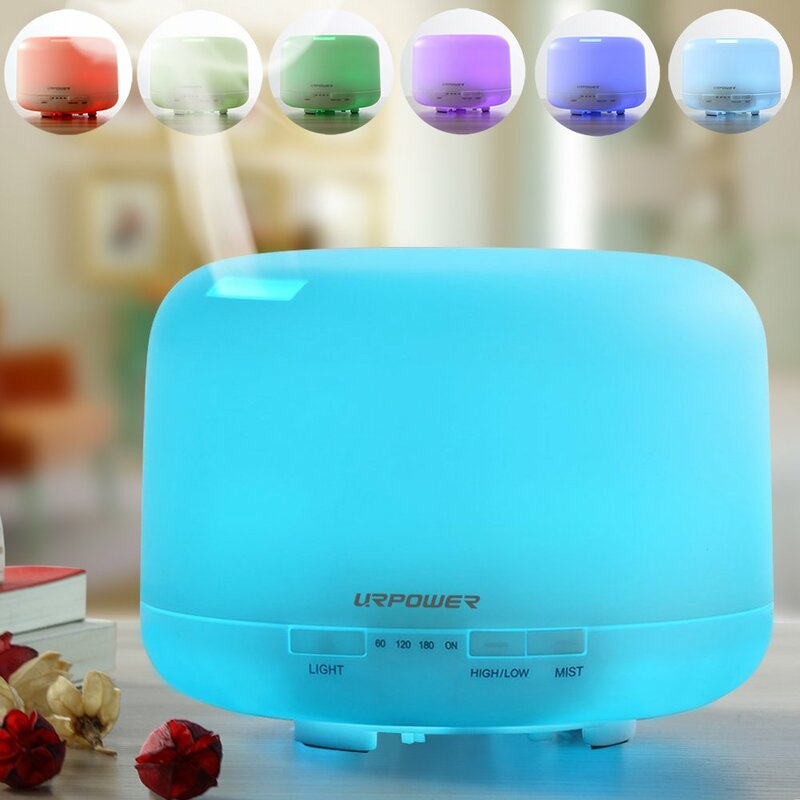 There are four major types of essential oils you will come across on the market that includes, ultrasonic, heat, nebulizing and lastly, evaporative essential oil diffuser. As mentioned earlier, a humidifier is specifically designed to add moisture to your home’s atmosphere. This device is quite useful during hot weather when the level of humidity in your home atmosphere goes down. Low levels of humidity are known to bring discomfort, skin dryness and the worst part increase the number of pathogens in the air you breathe. The humidifier is also one of the best remedies for several complications common during a winter season. According to studies a humidifier can treat symptoms of sinus congestion, colds, flu and any other illness common during the winter season. As you can see above, an essential oil disperses essential oils all over your house replacing bad scented air with a pleasing fragrance. On the other hand, a humidifier disperses a fine mist of water particles into your home air to add moisture. 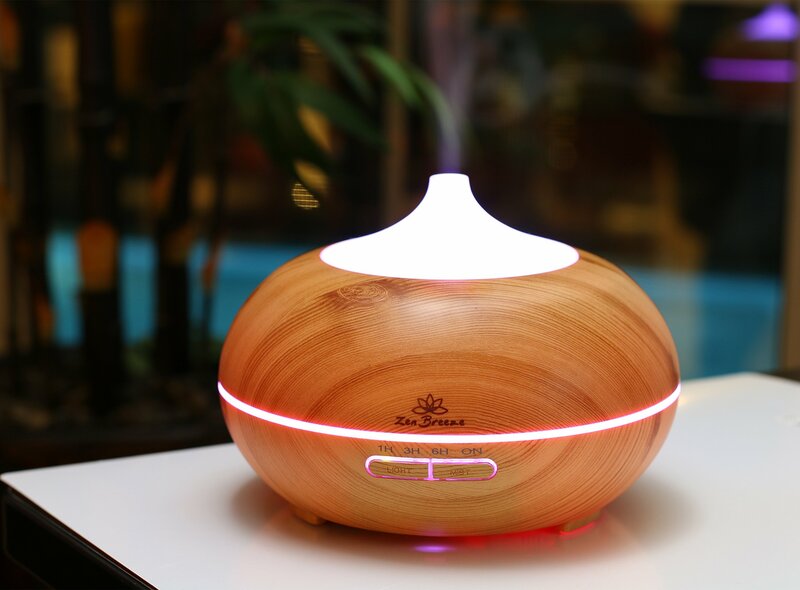 In short, Diffusers disperse essential oils while humidifiers disperse a fine mist of water particles. A diffuser disperses scented oils into your air adding a fragrance vital for aromatherapy. On the other hand, a humidifier disperses water particles that don’t have a scent but works best to increase the level of humidity in your house. In short, an essential oil can function as an air freshener simply because the oils smell good. Not all essential oil diffusers will work for a baby. This is because the essential oils in their saturated form can harm your baby hence the need to dilute them before use. A humidifier adds moisture to the air that is vital for your baby’s health, and you don’t need to take special precautions when using it on your baby. There are two common humidifiers you will always come across when you go out looking for one namely, warm-mist humidifiers and cool mist humidifiers. Whether it is a cool-mist or a warm-mist humidifier, it will always do the same job that is, to disperse a fine mist of water particles. The only difference is how they do it. Here is a brief overview on what makes them different. Just as the name suggests, a cool mist humidifier adds humidity to the atmospheres by dispersing a fine mist of water particles at room temperature. They are categorized into two that includes, evaporative and ultrasonic humidifiers. Unlike cool mist humidifier, warm mist humidifier heats up water before dispersing it into your home air. They are always considered the best since boiling the water kills pathogens releasing clean mist free of harmful microbes into your home air. According to experts, warm mist humidifiers makes a perfect choice for babies. Warm mist humidifier is simply a device that boils water before dispersing the resulting warm steam into your home air. Compared to most humidifiers on the market, they deliver the purest mists free of microbes. There are also some warm mist humidifiers that come with a mineral absorption pad that filters all the minerals in your water despite how hard it is. This mineral absorption pad is found inside the heating element saving you the cost of buying one. They are often quieter compared to a cool mist evaporative humidifier that uses a fan to blow the fine mist into your home air. Warm humidifiers are often considered efficient compared to most types of humidifiers. They are also cheaper, performs quite better and most importantly easier to use than most types of humidifiers. If you are looking for something that will make your baby happier, then a warm mist humidifier will undoubtedly do the job. However, you must always remember that just like any other device, a warm mist needs proper maintenance to work better for a long time. If not cleaned properly, the mineral left behind might build up inside the heating plate making it harder to clean. You should also be too cautious when you have kids around fond of playing with everything they find. This is because kids touch and play with everything and there is no guarantee that they won’t touch and spill over the boiling water inside the device. Warm mist humidifiers are also not recommended for people with breathing complications such as asthma. This is because warm mist can interfere with your breathing passage. So, it is always advisable that you consult your doctor before using this type of a humidifier to see if it suits you. If you are looking for something that will save you some costs on electricity bills, then a cool mist humidifier might be your best answer. Unlike a warm mist humidifier, a cool mist humidifier doesn’t boil water before dispersing it into your home air, meaning that you won’t need electricity in the process. There are two types of cool mist that include, an ultrasonic humidifier and an evaporative humidifier. Here is a brief overview of how each works. This is a type of a cool mist humidifier that uses a metal diaphragm that vibrates to break the water into ultra-fine droplets that are then delivered into your home air in the form of a fine vapor mist. An ultrasonic humidifier is one of the quietest humidifiers you can find on the market simply because they don’t use a fan making them perfect for sleeping babies. One drawback of using this type of a cool mist humidifier is that it doesn’t separate minerals from water, but delivers them into your home air in the form of white dust. This is one type of a cool mist humidifier that is quite perfect for your baby for many reasons. Cool mist humidifier, unlike a warm mist humidifier, comes with a wick filter that sits inside the device. The wick filter’s main purpose is to absorb the water and filter the minerals in it. Once the water is absorbed, the fan then forces the dry air through the wick filter evaporating and dispersing fine particles of water droplets into your home air. One great benefit of using this kind of a cool mist humidifier is that it delivers pure mist free of microbes that may harm your baby. It is also cost effective since it doesn’t need electricity to heat up the water before distributing it into your home air. However, depending on the hardness of water you use frequently, it might require you to replace the filters after some time. A humidifier is one great device to have in your home. They are good for your health as well the health of your baby. Result findings show that humidifiers can relieve several complications such as dry throat and cough, dry skin, sinus congestion, nose irritation, cracked lips and more. Unfortunately, not all humidifiers will meet your needs. What you must remember is that what works for you might not be the best choice for your baby. It is, therefore, important to do some thorough research to ensure that you buy one of the best humidifiers for babies. Here is are some of the things you should consider when looking for a humidifier for babies. Quietness: As a mother, you should be used to the fact that babies do cry when they are woken up unexpectedly simply because most of the times they find the noise produced by any appliance annoying. Look for something that operates quietly compared to others. Filter versus no filter: One drawback of most humidifiers is that they don’t separate dirt from your water before distributing it in your home air. The dirt may contain harmful pathogens that may harm your baby in one way or another. To be on the safe side, it is vital that you purchase a humidifier that comes with a filter. This is because a filter separates minerals and any other pathogen in the water that might be harmful to you as well as your baby when released into your home air. Price: Another important factor to consider when buying a humidifier for your baby is the price. You will come across more than enough humidifiers the moment you step into the market looking for one. You’ll also realize that apart from features, one major distinguishing factor is the price. Most of the time, cheaper humidifiers tend to be more appealing especially for those planning to use it for the first time. For those who know better, price matters a lot. The high price means, great features, safety, an astounding design and most importantly, high performance. I can guess that as a mother, you only want what’s best for your child. If you are too hasty in making decisions then chances that you’ll make a mistake are high when choosing a humidifier for kids. Always remember that your baby depends on you for safety. It is, therefore, important that you be keen enough to take precautions when choosing humidifiers for babies. To get a clue what this means, here are some common mistakes parents make when buying a humidifier for their babies. One common mistake people make when buying a humidifier is going for anything labeled ‘humidifier’ provided it fits a budget. As mentioned earlier in the article, there are more than enough humidifiers to choose from on the market, but not all will work for your baby. There are those humidifiers that will work perfectly for your baby as well as those that won’t. For example, if you go over the tips above, you will find out that a humidifier with a fan that makes noise will interfere with your baby’s sleep. You will also come across humidifiers without a filter, meaning that all the minerals in the water combined with all the microbes in it will be dispersed into your home air reducing the quality of air your baby breathes. It is, therefore, vital that you review the product carefully before making the purchase. It doesn’t matter how benefiting a device is. Before you make a purchase of something that will affect your health in one way or another, you should always consult a doctor. For example, as mentioned earlier, warm mist humidifiers might not make a better choice for those having breathing problems, this is because it interferes with your breathing. Health experts highly recommend that you consult a doctor before buying a humidifier especially if your baby is receiving any medication. Price is one factor that is quite deceiving especially when you looking for something that suits your baby. The low price might either mean low performance or fewer accessories. On the other hand, high price might mean, many unwanted accessories or high performance. As a mother, it is quite understandable that you will be looking for a better humidifier for your baby. Unless you aren’t sure of the reasons, you want that humidifier for your baby; it is vital that you pay less attention to price. Instead of judging by the price, consider factors such as safety for your baby and performance. You can’t buy something if you aren’t well acquainted with how it works as well as its level of performance. This is one mistake, most mothers can’t avoid simply because they believe in the word of mouth. Never forget that what works for someone may fail to work for you, but it is always better if you hear what they have to say about it. Doing some little research will save you some trouble such as finding out the disadvantages and the advantage of using a particular humidifier before making the purchase. You can simply do this, by going over some reviews you can easily access online. Investing on a humidifier for baby is on great achievement any mother can make. However, getting the best out of it requires you to add some extra effort in ensuring that it does nothing less or more than what you expect for your baby. The fact babies are quite delicate, requires you to be extra careful with anything you expose them to and a humidifier is not an exception. Here are some great tips you can use to ensure your baby enjoys all the benefits of using a humidifier. 1. Always follow instructions: It doesn’t matter how many humidifiers you’ve been using or how long you’ve been using them. Your baby’s health is more important than additional benefits you expect from the humidifier. Almost any humidifier you will come across on the market will come with a manual that shows you how to maximize on its use. There are also those that come with warnings to stop you from making a mistake. Find out if that manual has something important about using the humidifier on your baby. 2. Position the humidifier safely: One common accident when using a humidifier is the device falling to down and spilling hot water causing a burn. If you are using a warm mist humidifier, then you need to be extra careful when choosing a location to place it, especially when you have playful kids in your house. 3. Determine the level of humidity in your home air: As mentioned earlier, low humidity in the atmosphere isn’t good for your baby’s health. It is also not healthy to let your baby sit in a room with very high levels of humidity simply because, it might force your baby to sneeze, get skin rashes and the worst part, interfere with his or her air passages. To save yourself much trouble, you can use a hygrometer to determine the level of humidity is safer for your baby. 4. Keep the device clean at all times: Babies are too young to withstand the effects of pathogens. If you are using a cold mist evaporative humidifier, then you must have a clue that the wick inside leaves behind lots of dirt and minerals. There are also high chances that some invincible dirt might accumulate on the humidifier’s parts or just on the surface. The dirt may not only interfere with its performance but may also mix with the water particles in your home air compromising the quality of the air you breathe. 5. Consider regular maintenance: Just like any other appliance; your humidifier can break down or develop faults that may interfere with its performance. If you are not keen enough, minor repairable faults can damage your device forcing you to buy another one. The only way to avoid this is to schedule a professional maintenance. To achieve this, you need to inspect regularly all the parts, for example, the filters and fans. Clean all the dirt and dust you find on the parts and lastly, check if there is anything that needs replacement. Other tips include switching off and unplugging the device when you are not using it, preventing your device from tipping over when the water is boiling, ensuring that you use dry hands to handle the power knit and more. Always keep in mind that a humidifier will only benefit you when you use it properly. Proper maintenance and cleaning are some of the vital steps that will improve the air your baby breaths and increase the lifespan of your product. 1. What type of a humidifier should I choose? If you can access and read several online humidifier reviews, you will realize you have more than enough you can choose from. It doesn’t really matter provided you know how to use it. Almost all humidifiers function the same way, that is, they all add moisture to your home air. However, you might want to consider several factors such as price, performance, and most importantly features. There are four types of humidifiers you’ll come across that includes, Ultrasonic, warm mist, cold mist and UV germ-free humidifier. Check for something that meets your need. 2. What is the best humidity level to maintain? Humidifiers main purpose is to maintain the correct levels of humidity in your house, meaning that, the level should neither be high or low. According to experts, approximately 40% will do. Studies have shown that humidity above 50% will encourage the growth of pathogens such as bacteria, mold, dust mites and other parasites. On the other hand, humidity that goes below 30% will encourage the spread of flu and cold. Lower humidity will also lead to respiratory complications. To be on the safe side, it is vital that you maintain the levels within 40% to 50% and the best way to do this is to get a hygrometer that will help you to determine the right levels. 3. What is the correct size of a humidifier for me? Before you settle on a size you want to buy, you should have the measurements of the area you want the humidifier to cover in square footage. If you are lucky enough, you will come across humidifiers whose area of coverage is already specified by the manufacturers. Ensure you have correct measurements of the room you are going to use the humidifier, take it with you to any humidifier shop and find a humidifier that can cover that area. 4. How do I fill a humidifier with water? Humidifier can’t function with water. That’s a fact any humidifier lover should be aware of. But sometimes it becomes hard figuring out how to add water to it especially if you are using a different type of a humidifier for the first time. There are those humidifiers that have one water reservoirs as well as those that have more such as Console and table top humidifiers. To effectively add water to your humidifier, you need to open the reservoir and then pour in clean water. There are also some humidifiers that don’t have a reservoir. This types of humidifiers are installed in line with your water supplier. If the water inside is depleted, you have to check if there is water in your main water supply. 5. Is it okay to use hard water to fill a humidifier? It depends on the type of humidifier you are using. In the market, you will find humidifier with a wick filter that works best to filter the minerals in the hard water. Some don’t have this feature, meaning that they will deliver the water combined with these minerals plus other pathogens into your home air. Am sure this is not what you want for your baby. If you are in no position to access pure water, free of minerals and other microbes, it is vital that you buy either a humidifier that boils the water before releasing it into your home air or buy the one that features a wick filter. 6. How much energy will my humidifier use? It isn’t easier to know how much your humidifier will cost you when it comes to electricity bills simply because you will be using other appliances that require the same energy. The only way to know this is to connect you humidifier to its own sub-meter that you can check every month. However, the amount of energy your humidifier uses depends on several factors that include, the number of hours your humidifier uses the electricity, speed setting of your device and electricity rate. If you are too cautious of your monthly bills, then it is vital that you consider humidifiers that use less energy such as cool mist humidifiers and more. Whether you are using an ultrasonic, a warm mist or a UV germ-free humidifiers, you will always get the same results that are, right levels of humidity in your home air. This is vital for you, your baby or any other person you have in your house. The humidifier is one great appliance anyone seeking to live a healthy life should have. More than enough studies have proven that dry air can result in various complications such as colds, flu, sinusitis, nose bleeds, snoring, dry skin and more. Humidifier’s primary purpose is to add moisture to your home indoor air bringing back correct levels of humidity in your house. As a result, proper levels of humidity reduces chances of colds, flu, nosebleed, dry skin and more. It also works best to improve your baby’s comfort. However, to benefit fully from these remarkable devices, you must be able to find what suits your needs. If you have to use it on your baby, then it is vital that you go for something much safer. Finding the best humidifier for a baby requires you to do lots of research, that is, finding out what other users are saying and focussing on the rating. What you mustn’t forget is that not all humidifiers will work for you and your baby. They differ in price, sizes features and most importantly, performance. The best way to get what suits you is, to have correct measurements of the area you want the humidifier to cover, know what makes these humidifiers different and lastly, avoid common mistakes people make when buying humidifiers. You must also keep in mind that your humidifier will only serve you for a long period if properly maintained. You must clean it and check for possible faults each time you use it. If you can follow all the tips above, I bet you will be among the happiest humidifier lovers. Please check back soon for some new, updated content! If you have any questions, please leave a comment below and we will be more than happy to get back to you!